Here is step by step guide to install WordPress on HP Cloud with one Database Server and one Web server on Ubuntu and Nginx PHP5-FPM platform. There are some differences with the other kind of Public Cloud instances and HP Helion Public Cloud. We are writing about HP Helion Public Cloud, by the way; HP Cloud is not exactly the right word. You must read out previous guides – Router and Subnet Settings on HP Cloud and HP Cloud FTP/SFTP Setup, to make sure that the setup are right and publicly available. Two server configuration is considered to be difficult setup, yet this is the right setup for proper scaling. You will select Ubuntu latest LTS partner image while creating the instances (which is 14.04 at the time of writing). You can connect with the database server using the internal IP which looks like 10.0.0.x. You can disassociate the Floating IP to the database server instance when you do not need to SSH. This will ensure strict security. #like log file, port number, etc. # MySQL Welcome message will appear with " > "
People installs PHPMyAdmin for this small works. No need. If port 80 is not listening, nginx can not open it. Simple. On HP Cloud, OS software based firewall is not much of importance. You can control from one level up. Build an Instance with Ubuntu 14.04 LTS AMD64 Partner Image. 4 GB is great, you can use 2 GB for lesser traffic. Practically, more the number of cores, nginx works more better plus xcache works faster with more RAM. snmp should get installed but basically it does not get installed in expected way; it depends on vendor, so we install it later. You ideally should not have problem with plugins, themes and uploads. Only if you need to fix cannot upload media via WordPress uploader or update Plugins, then you should chown. Next are advanced guides to tweak PHP5-FPM, tweak Nginx etc. – if you perform a search on our website, you will get all the guides. We have guide on XCache with W3 Total Cache Plugin too. We have not linked because this guide is a basic setup. 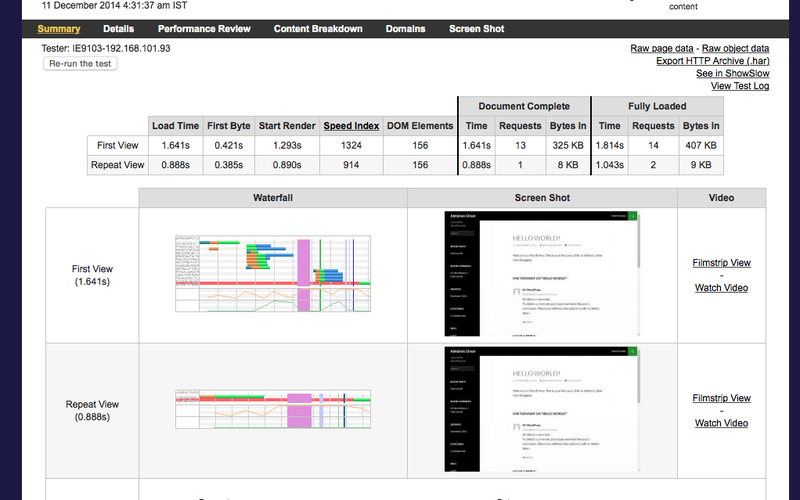 With 2 x 2 GB server instances, after WordPress installation, you’ll get your site loading within 1.6 seconds on webpagetest.org without any tweak, cache plugin, CDN. If you increase the TTL of A value to 50 years, around 280 ms will get decreased. 6 name servers are unique about HP Cloud. You’ll never get more than a number of websites on one set of name servers. Rackspace has only two name servers. HP Cloud is far better than Rackspace in terms of performance and infrastructure level support. Hardware is HP Blade Servers. If you can not install yourself, you can ask us, for a payment. When we will make the partnership with HP public, you do not have to bother about the backend. This Article Has Been Shared 8209 Times! Cloud Computing Leaders are not many in number. Only few Brands revolutionized Cloud Computing either offering as a free service or at a lower cost. Cite this article as: Abhishek Ghosh, "Install WordPress on HP Cloud (Ubuntu, Nginx)," in The Customize Windows, December 10, 2014, April 23, 2019, https://thecustomizewindows.com/2014/12/install-wordpress-hp-cloud-ubuntu-nginx/.